The technical advances made in terms of simpler and faster glucose monitoring systems confer significant benefit in the daily lives of patients suffering from diabetes. Additional requirements must be met in order to prevent the risk of errors arising from the use and interpretation of glucose measurements as well as to enable patients deemed capable to perform self-monitoring. Two main test system principles are available to patients with diabetes mellitus to help them control their glucose metabolism: Self-monitoring of urine and of blood glucose levels. The standard procedure is to measure blood glucose in fresh capillary blood, usually taken as a single specimen from the fingertip or earlobe. Additionally, devices for continuous blood glucose monitoring that rely on needle sensors are available. Such meters monitor glucose in the subcutaneous interstitial fluid and convert it into blood glucose equivalents.Patient self-management in vitamin K antagonist treatment requires regular INR monitoring, usually once per week. 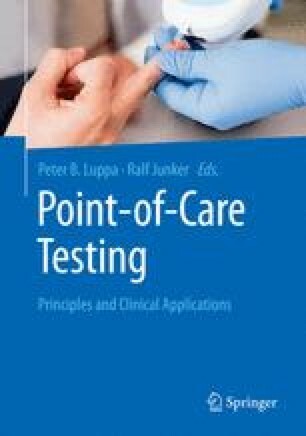 INR testing by the patients themselves at the point of care leads to significant improvements in clinical outcome and quality of life. Especially a significant reduction in the number of deaths on vitamin K antagonist treatment has been shown. By definition, INR is 1.0 in individuals with normal coagulation. Treatment with vitamin K antagonists causes higher values. Depending on diagnosis, e.g. thromboembolism, atrial fibrillation and heart valve replacement, the target INR nowadays has a target range of 2.0–3.0 in most cases.